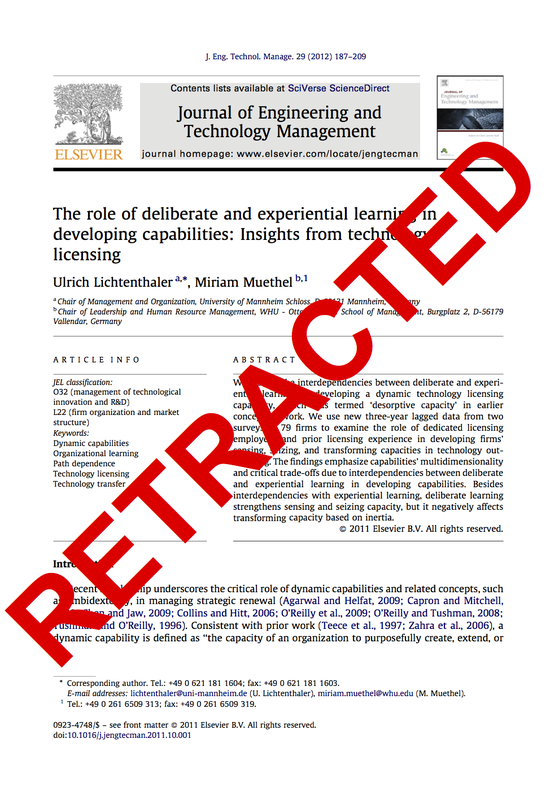 Two years after his first retraction — and six months after his most recent retraction — this week Ulrich Lichtenthaler received his 14th and 15th retractions from Entrepreneurship Theory & Practice. 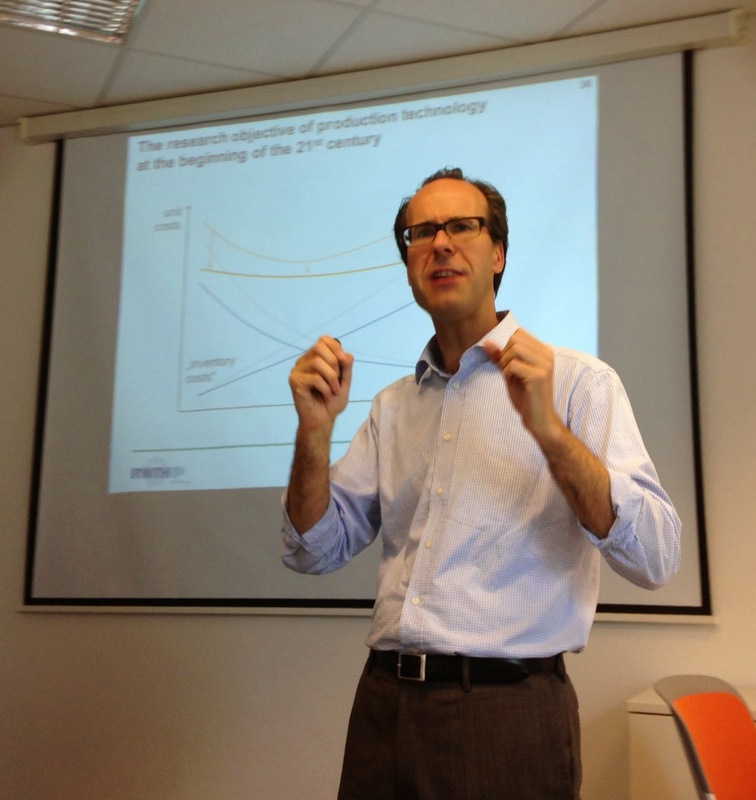 The above article from Entrepreneurship Theory and Practice, “Technological turbulence and the impact of exploration and exploitation within and across organizations on product development performance,” by Ulrich Lichtenthaler, published online on April 2012 in Wiley Online Library, DOI: 10.1111/j.1540-6520.2012.00520.x, has been retracted by agreement between the author, the Executive Editor, D. Ray Bagby, and Wiley Periodicals, Inc. The retraction has been agreed before print publication based on discussions about the presentation of the empirical results. This paper appears to have no citations, even in Google Scholar. 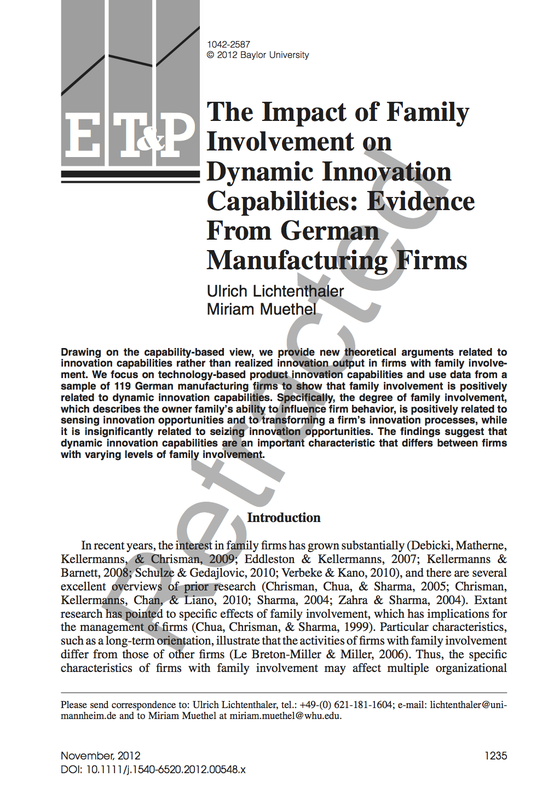 The other, entitled “The Impact of Family Involvement on Dynamic Innovation Capabilities: Evidence From German Manufacturing Firms,” was published online last September and appear in print in November’s special issue on family business. 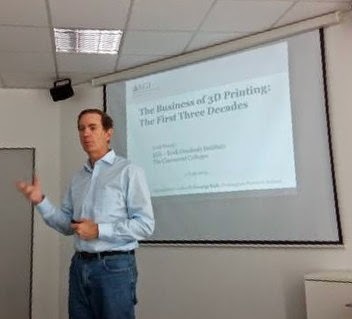 The article was co-authored with Miriam Muethel, who then (and today) is at the WHU Otto Beisheim School of Management. Dr. Muethel received her habilitation at WHU in December 2011, not long after Lichtenthaler completed his habilitation there. There is no explanation (yet) for the decision to retract this article, which apparently ETP has been considering for more than a year. It has 10 citations in Google Scholar, but only one of them from a major journal (a citation by the introduction to the ETP special issue). Although Prof. Lichtenthaler lost his license to teach nine months ago, no official announcement has been made about his position as a chaired professor at the University of Mannheim. However, according to hearsay, he has been recently investigating other career opportunities.